Kate from Madison, Wisconsin sent in this lovely Sunday supper story. Sunday supper at my grandma and grandpa’s meant so many things to my family and I. My grandmother, who hailed from Lexington, KY, made a long drive from the city well worth it. 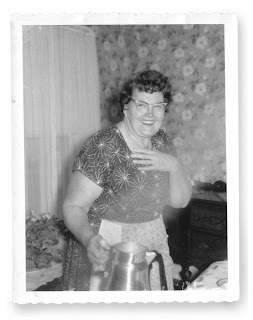 When we’d finally arrive at her house, my three sisters and I would pile out of the back seat of my Dad’s Chevy, run to the back of the house, and swing open the screen door to an indescribable blast of smells–fried chicken, mashed potatoes, shelley beans and corn, yeast rolls, apple and cherry pies, and on and on! My grandmother’s meals represented so much more than food to us. Much of what we ate had been nurtured in my grandfather’s garden–we ate fresh cucumber, beet, and cabbage salads all summer–with surplus “put up” for winter by my grandma. Only now do I understand how the patience and preparation that went into those home-grown, home-cooked meals, enriched my life and influenced my perception of food. 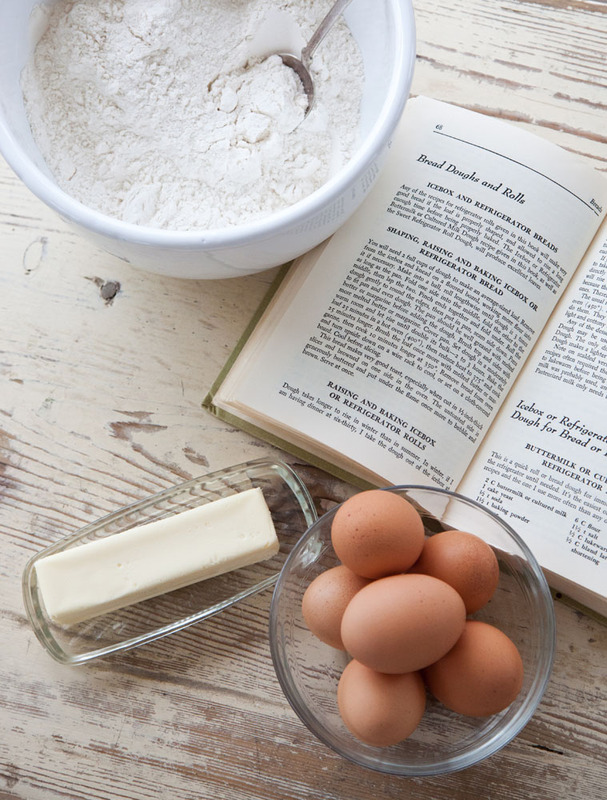 When my grandmother passed on, I kept her cookbooks, which still have bits of her beautiful handwriting on the worn pages. 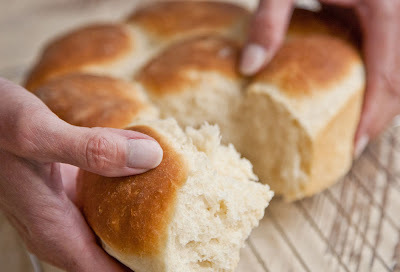 I am sure she based her yeast rolls on the recipe from those books, but the love she added to them made the real magic! 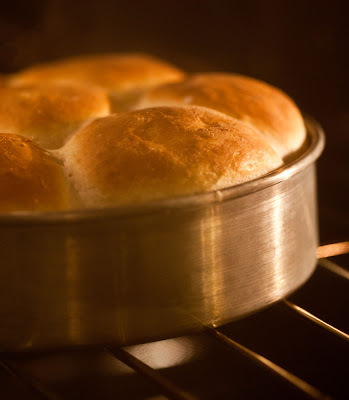 This is my adaptation of her Old Fashioned Dinner Roll Recipe. In a small bowl combine warm (110 degree F) water (please make sure that the water is no hotter) and yeast. Let mixture sit for 3 to 5 minutes. In a large bowl add butter, salt, and sugar. 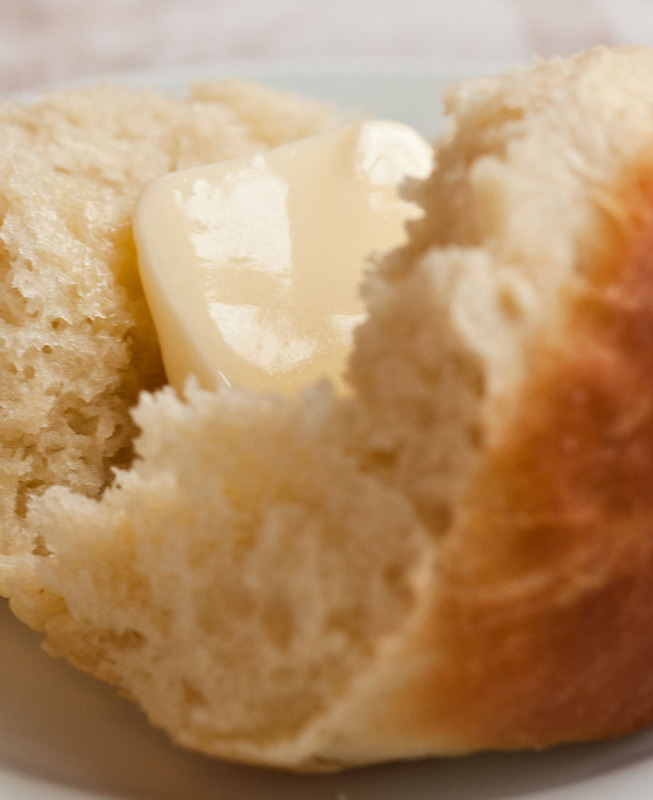 Pour milk over the butter. Add the yeast mixture. Beat in egg. Stir in flour and mix with a wooden spoon till it makes a soft dough. Grease another large bowl and put the dough mixture into it. Cover with a damp cloth and let it rest till it is until it is doubled in size. (Depending on the weather 1 ½ to 2 hours). When it has doubled, punch it down. Then form the dough into balls that are about 1/3 the desired size. For this recipe we chose to do large rolls, but you could make up to 14 smaller rolls. Place the rolls in greased pans. Let them rise until they have once again doubled in size.Bake in a preheated 425 degree F oven for 15 to 18 minutes until golden brown. Remove from pan and serve immediately. So that’s Kate’s Sunday supper story, now let’s hear yours! You do such a beautiful job with Return to Sunday Supper. I start to salivate with every new entry. Keep up the good work, Sue…and Jeff, the photographs are all suitable for framing. How much salt for this recipe? I’ve written the recipe as it was given to me, it did not contain salt. You mentioned salt in the instructions but not the ingredients. Do you know it that part needs omitted?